Large modern villa located in the heart of Albufeira, with plenty of bars, restaurants and activities all within a short walking distance. Private garden, pool table and barbecue. Located in the heart of Albufeira, this large villa is ideal for families or large groups that are looking for a quiet setting with excellent entertainment space. This 8 bedroom villa has undergone full refurbishment with new bathrooms, new tiles on the floor throughout, and all furniture is new. All bedrooms and living room are air conditioned. The property is a short drive to Pinecliffs Resort, Gale, and Guia, where Algarve shopping is located. In this area, there is a large supermarket, many shops supplying clothes, shoes and sports equipment. There is also a large cinema with all the latest releases in English. The villa is a 25 minute drive to Quinta do Lago. 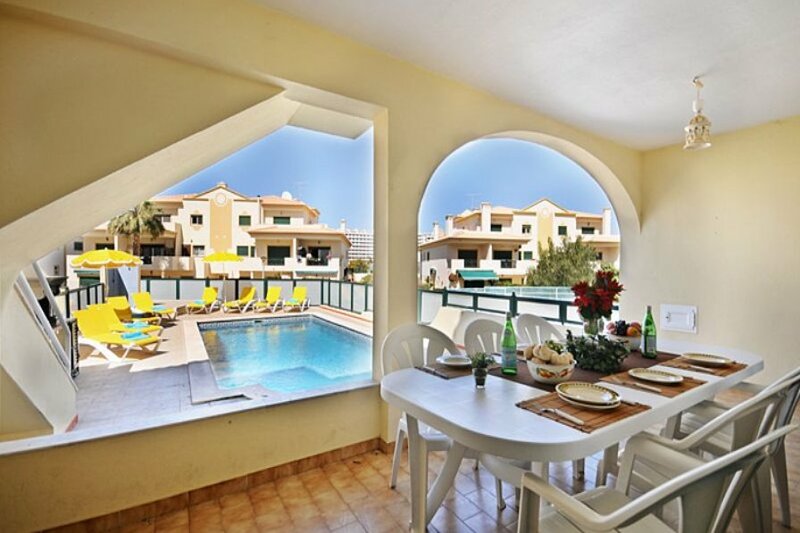 The property is surrounded by the best golf courses and lovely restaurants, with a supermarket approximately 500 metres away (large supermarket that houses most essential items). A wide range of sports facilities are available in Albufeira including golf courses, tennis and water sports. The property is within an easy stroll to the strip which is located at the end of the road (5 minutes walk). Villa Bella benefits from a large swimming pool that gets good sun coverage throughout the day for sun lovers. There is plenty of room around the pool for the 12 sun loungers, and large outside table with plenty of seats. There is also a BBQ beside the pool, and table tennis table that can be used. There is a large living room with an open plan kitchen which is fully integrated with breakfast bar. The living room has large glass sliding doors leading out onto the sun terrace with direct views onto the pool and gated parking area. The living room has plenty of sofas to accommodate up to 18 people. There is satellite TV with many English channels and an indoor dining area. Perfect for large groups that wish to be close to the pool throughout the day. Please contact us if you wish to arrange Wi-Fi for a nominal fee.